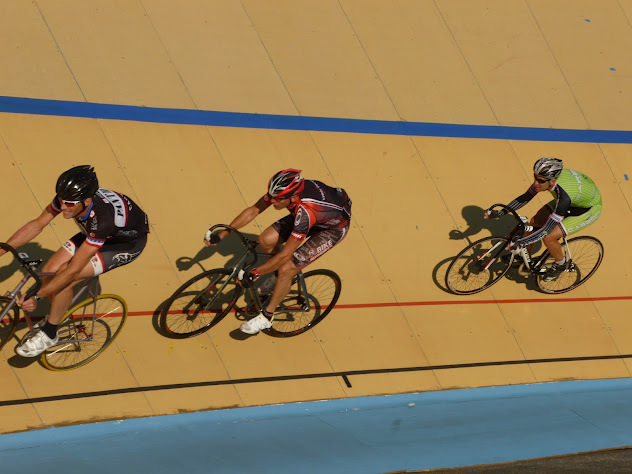 I figure I’ve ridden a couple thousand laps at the velodrome in the last 6 weeks. I’m pretty comfortable riding by myself, or riding in front with someone on my wheel. But staying tight on the wheel in front of me? Not as much. I don’t yet have a good feel for modulating my speed without brakes. I know this is largely a mental thing. They keep telling me: the good thing about “no brakes” is that no one is going to grab a handful. Overall it’s more smooth and predictable. I know that’s true, but it’s hard to undo the wiring of all those years of relying on brakes. The other aspect is trusting the others you’re riding with. When you’re following a wheel at 25mph+ and you have no brakes, you have to trust that the others around you are going to ride in a predictable manner. That’s a big reason why everyone has to learn the track etiquette and have the basic skill of being able to ride in a straight line. The trust aspect is there when we race on the road too, but it seems more critical on the track. If you’re in a criterium and there’s a rider who’s making everyone nervous, it’s usually not a problem to just avoid them. But on the track everything seems more compressed. Thursday night we had 4-5 guys in a paceline (see video above). We started out with 2 laps pulls. Then from the infield Brett called for 1 lap pulls. Then 1/2 lap pulls. So we had someone pulling off frequently, combined with passing some other riders below. This is when it registered: I just have to trust that the other guys are going to do the right thing. They’re going to keep a steady speed, hold their line when they pull off, see the other slower riders that we’re passing. I still wasn’t holding the wheel in front of me as tight as I’d like. But it was progress. Here is a video with one of the neighborhood kids (Victor) riding the track. At that age I’d play “ball sports” with older kids, but I don’t think I would have had the balls to get on a bike and ride around a track at 20mph with a couple of adult racers. We get on the track and do a couple laps. Notice that he’s wearing real bike shoes and using clipless pedals. Then I go by and keep going. A few leps later, Brett gets on, and when we come by Brett tells Victor to get on the back. You can see Brett hold out his hand, counting down each lap. Then Victor showed me how to ride up the track from the apron to the start rail, hold on to the rail then let go and start. I’d never done that before. Predictable answers included things like new bike, new trainer, power meter. My answer? We got a brand new velodrome. A new $300k toy. That’s what it feels like. How could we in the NE Ohio cycling community have gotten so lucky? We got lucky because a group of people did the hard work to make it happen. I have to admit that when I first heard about the project, I was skeptical. Great idea, but no way could anyone pull that off, around here anyway. Even when they announced that they would start building, my thought was that I’d believe it when I saw it. Sadly, I think that we in this area have been conditioned to be skeptical and cynical. We believe it only when it happens. The big lesson is that things only happen when people commit to making them happen. They may not always succeed, but they’ll never succeed if they aren’t willing to try and to possibly fail. So. We in the cycling community have this new toy. Only this new toy needs ongoing support if it’s going to last, and if it’s going to progress to the next phase. I rode the track a handful of times, and it was enough to get me thinking about making a donation to join the Founders Club ($1000). Then seeing local neighborhood kids riding the track convinced me. The kids have been there just about every time I’ve been there riding. If the goal of 120 Founders Club members is met by end of the season, members get a season pass through 2015. That’s a pretty good deal. Of course you can donate whatever amount you are able. Now that we have this, it is up to us to support it. I still hear the echoes of Brett Davis yelling that at me the first few days I rode on the track. The black line is the lowest line on the track — and the shortest (and therefore fastest) way around. The really good guys, he said, will even ride a bit under the black line. So I’ve been practicing. The tricky thing is, if you’re looking down at the line, you’re going to have a hard time riding a nice, steady line. So I don’t look down. But then I see a picture of myself riding, and I see, nope, I’m not really all that close. Trying to ride right on the black line to me feels like trying to ride right on the edge of the road, to the right of the white line. I feel like I’m going to fall off the edge. This is one of those examples that makes it clear that there is a large mental component to physical activity. You can practice and practice but if your brain isn’t cooperating it’s going to be difficult. So I try a few mental tricks — looking where I want to go instead of where I am, aiming for the blue apron instead of the black line. I try it, then let myself peek down at my wheel. Close but not quite yet. Then tonight I ‘got it’. Well, for a few laps at least. Riding pretty close to the black line the whole way around. I don’t know that I can do it over and over, consistently, at race speed. But it’s a start. And as a bonus, in the process of writing this, I discovered that there is actually a cool web site called “Ride the Black Line“.